You’ve put it off long enough. The concrete at your complex continues to take a turn for the worse. Sure, you could wait until you receive a complaint from a resident. But that’s not how things are done at your apartment management company. The fact is you need to hire a concrete contractor as soon as possible. But with so many commercial concrete contractors in Denver, how do you know which one is best for you? Keep reading to learn more about McDonald Waterproofing & Restoration and how we can help. Concrete strengthening – This is done with carbon fiber systems and engineered steel bracing. When it comes to challenging structural component repairs, concrete strengthening is a must. Concrete repair – We routinely perform concrete repair with partial and full depth replacement using polymer modified repair mortars. You can feel comfortable knowing that McDonald uses a “no band-aid” motto, meaning we focus on long-term concrete solutions as opposed to simply masking the issue temporarily. Concrete crack repair – Minor cracks in concrete may not seem like a big deal at first. But they can allow water and chemical infiltration to turn small issues into huge problems. You can expect our concrete specialists to use epoxy injection and urethane grout injection when handling crack repair. As part of our annual inspection and maintenance programs, we can identify and remedy these issues before they cause additional damage. With concrete crack repair, it’s imperative to take a proactive approach. Concrete protection – Are you a business property manager? You may not realize it, but those high traffic areas and parking decks are exposed to a number of chemical and environmental impacts that can shorten their service life. Protection coatings of urethane/silicone caulking and epoxy, urethane, and methacrylate add a coat of armor to your surfaces. Structural sealant repairs – It’s important to know that constant exposure to Colorado weather leads to sealant repairs. Our solution involves wet sealing window perimeters with silicone sealants. Horizontal waterproofing – Does your space have unsightly leaking plaza decks, walkways, or planters? Horizontal waterproofing liquid and sheet-good applications will do the trick. Post tension concrete – This can be used for repairs, modification, and strengthening of reinforced concrete and post-tensioned structures. Should the post-tensioning in a slab be corroded or damaged, put your trust in McDonald. We have the expertise to perform the necessary repairs and bring the slab back to its full potential. Commercial concrete contractors are hard to come by in the Mile High City. Luckily for you, McDonald makes fixing concrete hassle-free. With nearly two decades of experience, we operate with honesty, friendly, and quality at the forefront of what we do. Unlike other concrete restoration companies, we understand the dynamics and conditions of concrete while also applying the best technology available. Clients find that our approach actually saves them time and money in the long run. 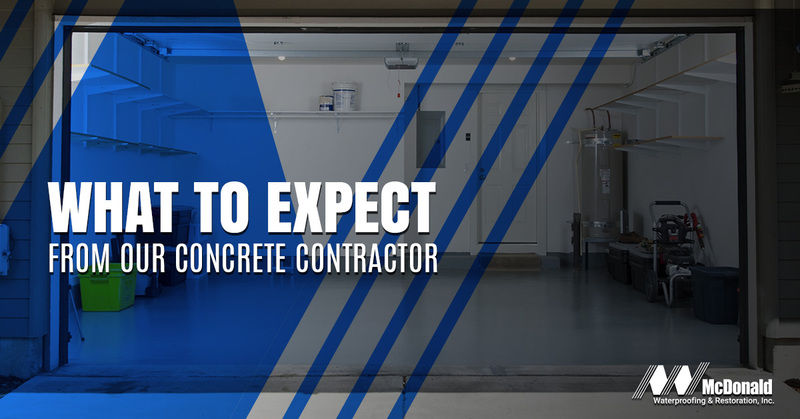 For a concrete contractor you can trust, contact McDonald Waterproofing & Restoration today.